Home »Comics»Deadshirt is Reading: Dept. H, Power Man and Iron Fist and Big Trouble in Little China! Deadshirt is Reading: Dept. 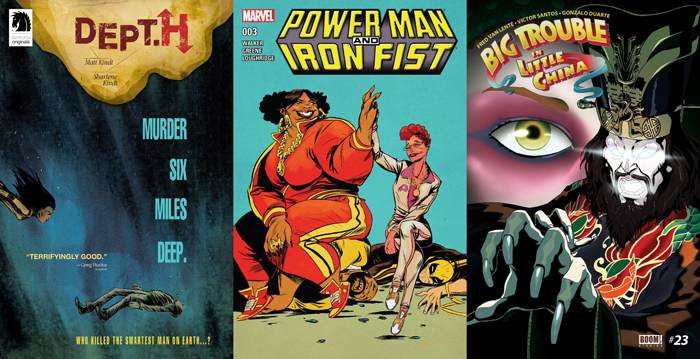 H, Power Man and Iron Fist and Big Trouble in Little China! DEPT H is a locked-room mystery that takes place at the bottom of the ocean with a surly crew of characters. In a very real future brimming with pandemics and refugee crises, a government organization called USEAR (Underwater Science Exploration and Research) has funded a team for deep sea experimentation, but after an “accident” claims the life of its head scientist, USEAR smells a mole and sends down none other than the daughter of the deceased to solve the crime. Matt Kindt has teamed up with wife and colorist, Sharlene, for this venture, which is actually kind of perfect for a rather intimate murder mystery. For protagonist Mia, solving her father’s alleged homicide isn’t only difficult because the crime scene is under miles of water, but also because she has a personal relationship with many of the murder suspects. This issue manages to take care of all of the usual first installment chores of world-building with ease while weaving in emotional complexities between characters, so that by the end, you not only grasp the concept but are heavily invested in the story. DEPT H has the same kind of gorgeous contrast between organic and futuristic elements that I enjoyed with Dustin Nguyen’s watercolor work on Descender, only even more so. In the accompanying letter to the readers, Matt Kindt says that he really wanted his wife on color because of her superior painting skills, and she truly does take the piece to the next level (or depth, rather) with the way she bleeds the blues of the ocean onto each fibrous page. Speaking of depth, physically and emotionally, the art team even explores the spaces in between the panels relative to the things left unsaid between lovers, and the visual results are so on point. I’m not usually a fan of the murder mystery genre, unless, evidently, it gets a Jules Verne spin and a gorgeous paint job. The Kindt team has created something special with this new series, and if every issue gets its hooks in you like the first one does, there could be years of addictive agonizing over this Jacque Cousteau-done it thriller. It’s been a long, strange trip with this series. One of those “long-belated sequel to a cult classic movie” series that pop up in a lot of places, Big Trouble in Little China plays it a little broader than its source film but still captures that almost indefinable mix of meta-humor and adventure that characterizes it. Uncharacteristically, issue #23 plays things almost completely straight. A couple issues ago, Jack Burton and his best friend’s daughter Winona Chi were magicked back to Chinatown in the 1900s. There they encounter younger versions of the series’ good and evil wizards, Egg Shen and David Lo Pan. Yes we have a prequel here, and while prequels have their pitfalls, the original film was so deeply embedded in the Old West Chinatown story and imagery that this feels like a natural place to take Jack. (In fact, the film’s original script was a Western.) This issue is a bit of connective tissue between beats of a ”how we got here” prequel story. Lo Pan comes into possession of Winona Chi’s phone, which, despite the lack of any wireless network, is able to access a modern Wikipedia. Having knowledge of the future seems to accelerate Lo Pan’s ambition and magical prowess, and he quickly devises a way to use the San Francisco Earthquake against his enemies. Meanwhile, Jack Burton tries to reach a mourning Egg Shen–whose wife died of typhoid immediately after emigrating–and shows a melancholy side to himself that puts his usual bravado into a new context. Considering this is an issue of Big Trouble in Little China without any jokes, the comic doesn’t really stand out on its own. But as an interlude in their larger prequel/time travel storyline, it was brave and probably necessary to take it down a notch here. One of the ongoing problems with the series is making it too over-the-top and cartoony. Allowing it to breathe and letting it be an adventure comic instead of a joke delivery vehicle is the right call. It’s just a shame that dialing back the gags actually leaves the book feeling rather bland, which tells me that the current creative team needs to find the balance that the movie had. Power Man and Iron Fist has been great so far, for two seemingly contradictory reasons. The strength of the book lies in both its level of exaggeration and its surprising depth and realism. While most comics that tout themselves as “grounded” generally focus on violence or misery, PM&IF focuses on small moments and believable, dopey characters. Luke Cage and Danny Rand don’t spend most of the issue striking poses; instead, Sanford Greene has them shooting looks at one another or squeezing into a tiny sedan. It’s an unassuming take that feels like two actual friends hanging out, and the vibe of the comic builds out from that. This is a corner of the Marvel universe where people hear about stuff via viral videos instead of forced exposition, and both heroes and henchmen are sorta clueless. It’s natural and believable, and the action, although almost caricature at times, is a perfect fit. This issue also plays with a really interesting idea: that of racism and classism in magic. Heroes for Hire focused a lot on the kinds of crime and conflict that fell through the cracks for teams like the Avengers and the Fantastic Four, and here it’s even more explicit. The Supersoul Stone, a magic MacGuffin the heroes are after, is too “street” for Doctor Strange to waste his time on, but we see the power of it in rampages throughout the book. Instead, Luke and Danny seek out Señor Magico, a lower rent barrio sorcerer who nonetheless is an expert on this kind of magic. It’s a clever take on the biases of Strange’s “master of mystical arts” studies, and one that feels at home in the world Walker, Greene and Loughridge have built. If I had one complaint, it’s that Jessica Jones has sort of been reduced to the role of a scolding mom. I don’t lay this on the team of this book specifically, as that’s the direction she’s been pushed in over the years, and they do get some fun mileage out of featuring her for a scene. But it’d be nice if they had the leeway to get her back out into the fray, instead of always being the one stuck at home with the kid. Still, I had a great time with this issue, and this book. In a landscape of comics defined by characters doing either monologues or stand-up routines, it’s nice to see a couple guys who just talk like guys.